There is nothing quite like the feel of a sturdy, solid wood dining room chair. The comfort and stability of solid wood, Amish made chairs exudes value - certainly one of the finer things in life. Sheaf-back chairs are named for the shape of the spindles in the back of the chair, representing a sheaf. (A sheaf is one of the large bundles of wheat or other cereal plants that are bound together after harvested.) Sheaf-back chairs are popular styles amongst Amish built chairs, and help to provide architectural stability, comfort and beauty to the chair. 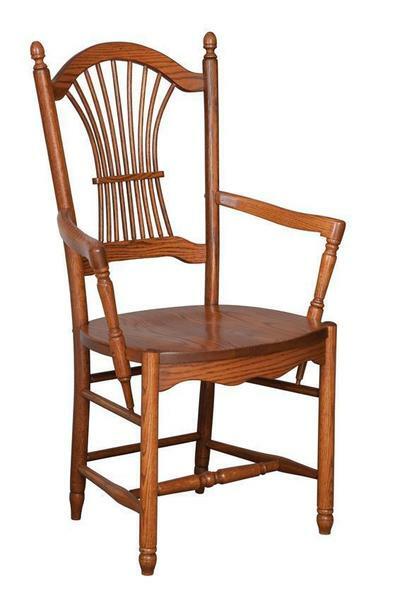 Our Hanover Sheaf-Back Dining Chair is available in a variety of solid woods and finishes. Wood seats are standard, but fabric or leather can be ordered as optional upgrades. These gorgeous sheaf-back chairs come as either side chairs or arm chairs. Give us a call at DutchCrafters to speak with an Amish furniture specialist who can assist you with your order of a set of sheaf back dining room chairs today! I received my chairs this morning and they are a PERFECT match. Thank you for all of your help. I've spent 20 years in customer service and you are great. Hi, I just wanted to let you know that we LOVE our new furniture. The craftsmanship that went into these pieces is beyond compare. We like well made furniture and these are the nicest pieces we own. We will definitely be buying from you again! Everything was perfect and of heirloom quality. Thanks again for your assistance with our order.